Image Size: 7 X 10 in. "We would all love our children to have a dream that would motivate them enough to do anything to achieve it. 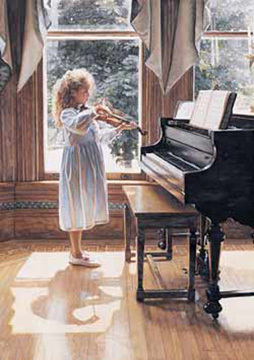 The first time the little girl in "Beginning" had ever held a violin was the day she modeled for this paintings. Years later, her mother and she came to see me and proudly told me that because of this painting, the daughter took up the violin and has now become a very accomplished violinist."